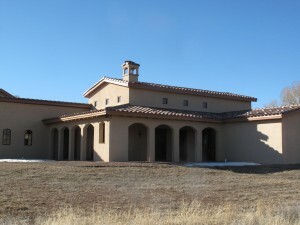 PRICE SLASHED down to $375,000 on Custom Mediterranean home at Grandote Peaks Golf Club in La Veta. The Lisbon suggests Old Tuscany with wrap-around portal around a tall-ceiling great room, the accent of a stone-clad turret study, and a cluster of tile roofs. La Veta Town Trustees have allowed the expiration of the moratorium on marijuana sales within the Town. It was not seen as an indication of future approval, but most agreed that they did not want to rush t0ward approving a new proposed Ordinance before Huerfano County has finalized or LaVeta has completed regulations and zoning ordinances IF, any marijuana retail sales should be approved soon. Neighboring Walsenburg, Colorado has already voted to approve marijuana sales and is drafting their regulations at this time. La Veta says, not so fast. So any new Ordinance vote to approve MJ sales was tabled until another public workshop could be held later in the week. Public attendance was light and Trustees questioned the citizen’s lack of input and MJ weed sales effect on youth or on tourism. Tax revenue was also debated in relation to Town cost of regulating and enforcement. So, at least one more additional planning session before any final determination vote. Big Town Hall Board of Trustees Meeting tonight. La Veta opens the floor to public comment on suggested proposals to move forward on development of both medicinal and recreational marijuana ordinance and zoning regulations? A large crowd is expected. Comments Off on La Veta Marijuana Ordinance? Rumor has it that the Next Door Deli may be expanding. They are considering obtaining more indoor seating in front corner of the old Hardware/Gym at Main and Francisco. The Deli has been a fantastic popular alternative in La Veta for over a year now. Time to expand. Sad news that Mary and Adrienne are retiring. They plan to work less and play more. Thankfully, they will still be baking some breads and baguettes on a weekly basis, so get your orders in to them. A wonderfull blessing of rain last night throughout Cuchara Valley and extended surrounding area. Nearly a half inch. Unfortunately, it also brought a 30 minute lightning show with it. So there may be some new hot spots but we have the people and equipment here to handle it. Forecast calls for afternoon shows every day for the next week! Whoopee. Several hot-shot crews are still staying up on the mountain in spike camps full-time, digging in fire lines and to be more accessible to the fire. Hazardous conditions so usually an EMT-Paramedic on the mountainside with them. Helicopters already airborne this morning looking for any new problem areas. FYI, correction on Homes lost to the fire. Only 13 homes, other structures were barns, etc. None lost in our immediate area of La Veta and Cuchara Valley. And Wahatoya 360 is officially back open now. East Peak Fire approaching full control. Today reports 70% containment. Wahatoya Valley Rd. 360 expected to open later today. Hot-spots mostly on eastern slope of East Peak, well away from Cuchara Valley. 19 homes were lost on eastern slope. 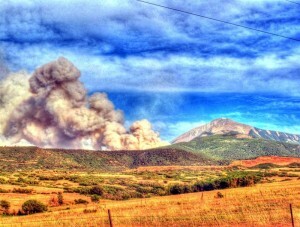 Fire has covered about 13,000 acres total so far. Hot-shot Teams have been amazing. Hiking, crawling and climbing in. Ground and air support is outstanding. Everyday I see a new truck in La Veta from states everywhere. Elk Creek, Chino Valley, Bonneville, Palmer Lake, Rapid City, Deer Mountain, Leadville, … too many to name and thank. Here is a great link to the East Peak – La Veta Incident Command site. Progress today on the fire line. 316 firefighters attacking the mountain-side. Trucks and rigs from surrounding area states. Bullshead, Miles City, Arrowhead Hot-Shots, etc. 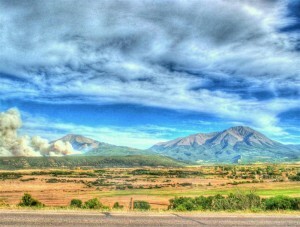 Plus from all over Colorado. Also 4 helicopters and 2 slurry tanker planes. Friday night transitioned command over to the Rocky Mountain Incident Command Type II team. Sat. morning looked calm and clearing, but then afternoon hot shifting winds are still creating new trouble canyons with acreage now estimated at 11,365. 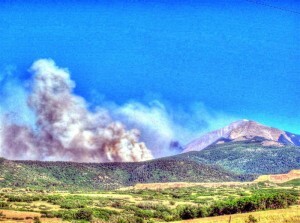 Still contained to the N and E side of East Peak but moving somewhat lower on the mountain toward La Veta. And extending much farther east toward I-25 and Walsenburg. Some winds are predicted to turn around toward the west Sunday. Red Flag Warning all day but but finally this evening a report of 10% containment. Some small progress.